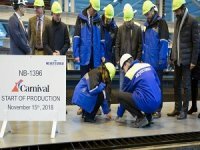 Carnival Cruise Line has cut the first steel and revealed the new livery for its 180,000-ton XL vessel that will be the first-ever ship operating in North America to use LNG. 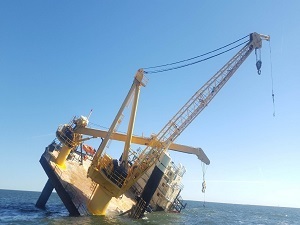 The vessel will be the line’s largest vessel to date and the first to be powered by LNG.The steel-cutting ceremony was held at the Meyer Turku shipyard in Finland, and the vessel is expected to be delivered in 2020. 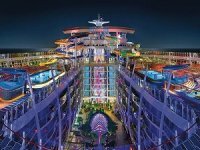 A second XL ship will start construction in 2020 and be delivered in 2022 to mark the 50th anniversary of Carnival Cruise Line's founding. 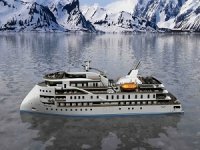 The first ship will have a red, white and blue hull design that celebrates its U.S. legacy. 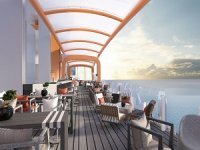 The design was developed by New York-based Bluarch Architecture and is inspired by officers' uniforms along with vibrant red and white accents running the length of the 5,200 passenger, 1,130-foot-long ship.The ship will operate from Port Canaveral, Florida, and her name is scheduled to be revealed in early December. 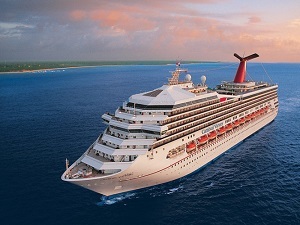 Carnival Cruise Line has 26 ships operating three- to 24-day voyages to The Bahamas, Caribbean, Mexican Riviera, Alaska, Hawaii, Canada, New England, Bermuda, Cuba, Europe, Australia, New Zealand, the Pacific Islands and Southeast Asia. 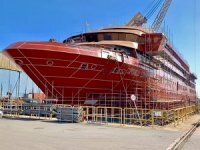 The line currently has three new ships scheduled for delivery – the 133,500-ton Carnival Panorama set to debut in 2019 and two 180,000-ton ships in 2020 and 2022.